I’m not really sure when my love affair with cheesecake started. As long as I can remember I enjoyed the sweet, rich, cream-cheesy deliciousness. I don’t discriminate. I love all kinds of cheesecake: turtle, plain, cherry, chocolate, vanilla bean…you name it. But one kind I had never tried was key lime cheesecake. I decided I was going to try to make one, but I wanted to up the ante a little. It’s been so gray and drab these last few months with winter in full swing, that I thought it would be fun to make a vibrant, colorful (and fruity!) cheesecake that could be served at Easter, or any fun springtime gathering. Paula Abdul was right when she said that “Opposites Attract”. All the best things in life are opposites: salty and sweet, chocolate and peanut butter, vanilla and chocolate….and sweet and tart are no exception! This cheesecake has just the right amount of lime zing to it, while still capturing the cool, creamy sweetness that we all love. 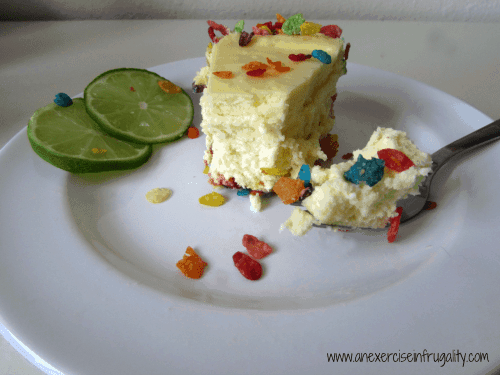 Are you ready for a delightful cheesecake that would have made the Golden Girls proud but will still be a fun and colorful dessert the kids will love? 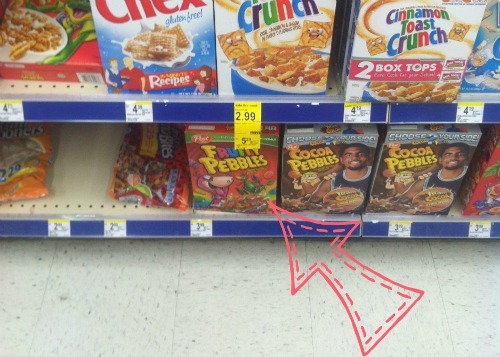 First I picked up a box of Post Fruity Pebbles at Walgreens. BONUS: Post cereals will be on sale for $1.99 from March 30-April 5 (while supplies last) making this a budget-friendly dessert option! 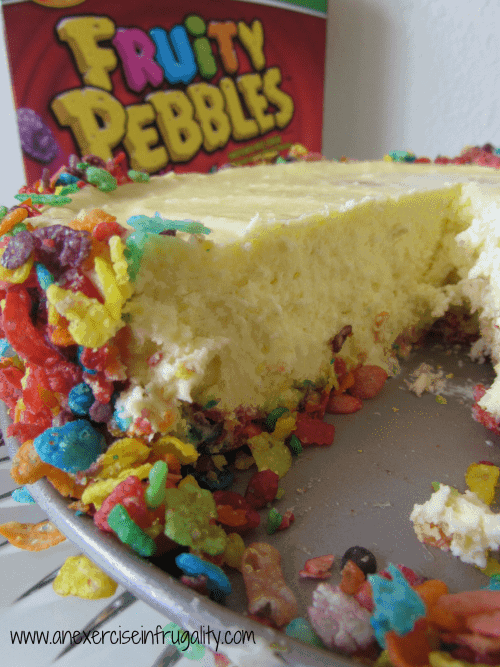 You could use the Cocoa Pebbles instead with plain cheesecake, but in the interest of being bright and SPRING themed, I went with fruity! Then grab your springform pan. Make sure it’s non-stick like the springform pan I got on Amazon. Now you’re ready to make some magic! Melt the butter in a microwave safe bowl, stir in the cereal crumbs to coat evenly. Press into the bottom and sides of a springform pan in a thin and even layer. Put in fridge for at least a half hour. In a large bowl, mix the softened cream cheese, sugar, cornstarch and lime zest (if using) until fluffy. Add eggs one at a time and beat until thoroughly incorporated and just smooth. Add lime juice and stir gently by hand. Be sure not to over mix. Pour filling into prepared crust and smooth out until even. Place a small, shallow pan of water in the bottom rack of the oven. On the upper rack, place the filled springform pan. This will minimize cracking. Bake for 60 minutes or until set. Turn the oven off and open oven door approximately 4-6 inches and leave cheesecake in oven for an additional 30 minutes before removing and refrigerate overnight. This cheesecake turned out SO creamy and wonderful I finally forced my husband to take it to work with him, or else I would have polished the whole thing off myself. Seriously, it was that good. This would make a fantastic Easter dessert or treat for any springtime gathering. I love the bright colors and the citrus flavor makes your tastebuds sing! It’s worth mentioning as well that this recipe is gluten-free. Just double check that the cornstarch you’re using isn’t manufactured in the same plant as wheat products. 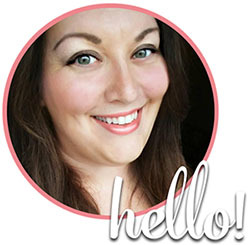 Brands like Argo and Clabber Girl are safe! 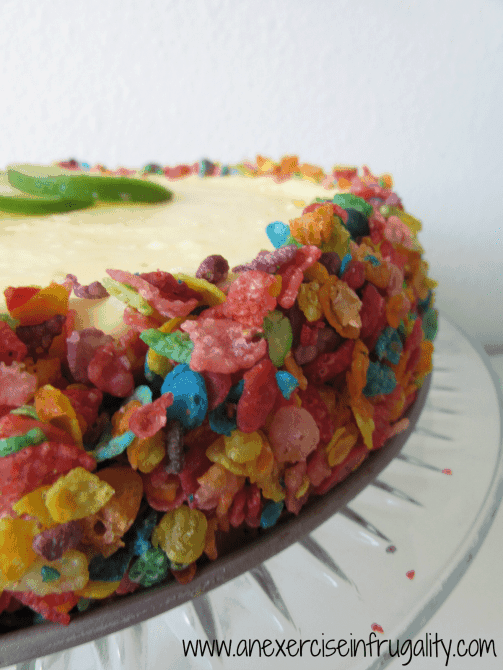 You might have noticed the recipe calls for crushed Fruity Pebbles, but the picture of my cheesecake shows them whole. There’s a good reason for this. I made mine un-crushed because I thought it would look nicer with a fun texture, however we had rogue Pebbles all over the place. They were falling off the cheesecake in a trail from fridge to counter top! I decided that it would be best to have them be crushed to avoid the hassle of them not sticking together as nicely. Still bright and colorful, just not as many Pebbles on your floor! So what do you think? Let me know if you give this great recipe a try. Do you love cheesecake as much as I do? What’s your favorite spring time dessert? OMG! I never would have thought to make something like this, but now I’m pretty sure that I HAVE to! YUM! I love Fruity Pebbles and so do my girls. Pinning! This is so creative and it makes me think of something you could bring to a kid’s Easter party. Oh it would be perfect for an Easter party! Thanks for stopping by! The correct answer is never. LOL It was awesome! This is so fun! 🙂 I love this. Pinned! Thanks, Carrie! Let me know if you try it! This seriously looks HEAVENLY!! 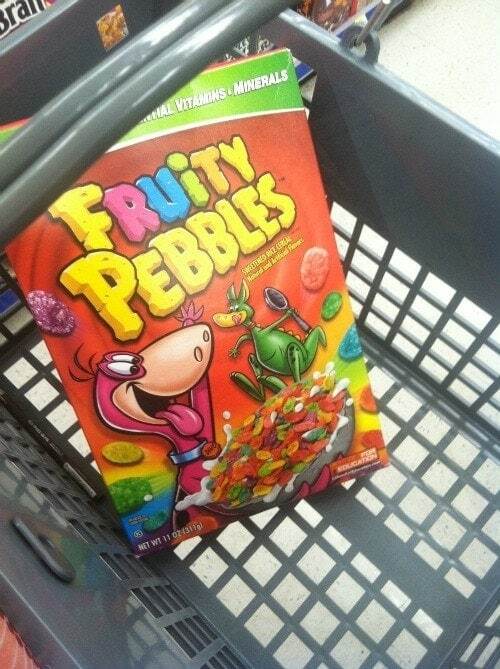 And what a creative idea with the Fruity Pebbles!! I have to PIN this for later!! Easily the best cheesecake I’ve ever made. I think the tartness of the lime goes great with the sweet fruitiness of the Pebbles. 🙂 Thanks for checkin’ it out! 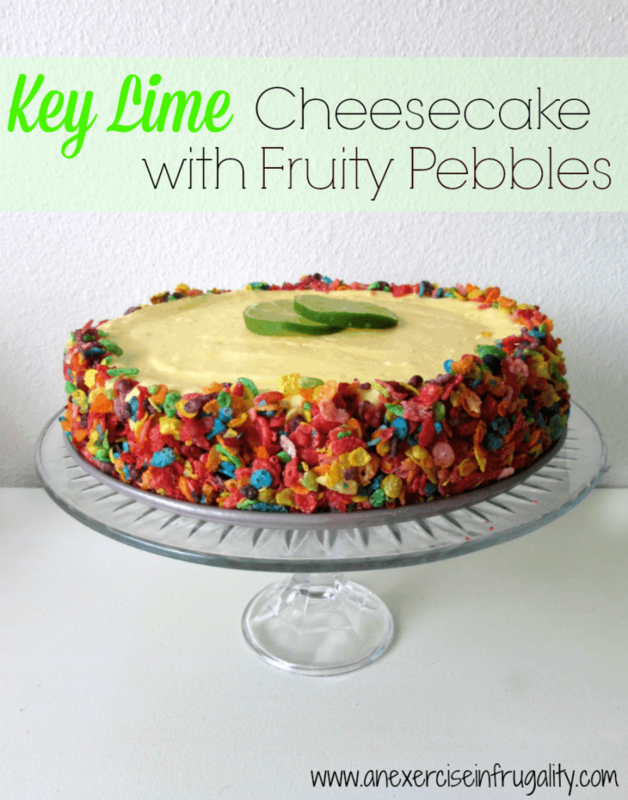 I really love key lime and the fruity pebbles make it perfect for spring.